Currently browsing articles with a topic of "department of natural resources". I’ve had my share of embarrassments in recent years. There was the time at a bluegrass show when, immediately after performing “How Many Biscuits Can You Eat,” I choked on a country ham sandwich. I’m the guy who tripped over the curb a while back as I stepped up to shake hands with the Vice President of the United States. I’ve fallen out of boats, pitched backward off barstools, stumbled up escalators, tumbled down stairs, and spilled enough drinks at public dinners to float the Oxford-Bellevue Ferry. Some of my hall-of-shame moments have been painful, and others downright funny, but there’s nothing remotely entertaining about my most recent embarrassment. In fact, everyone in Maryland shares my latest shame. 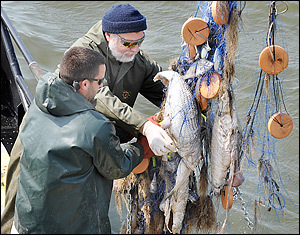 Last week, Chesapeake Bay anglers found and reported another fourteen hundred yards of illegal gill net containing more than three tons of dead and rotting fish. Add another nickname to the list that includes The Free State and The Old Line State: Maryland – The Poaching State. Read More!